HIDI aims to improve accessibility to immunological assays and expertise for researchers across the University. The University of Oxford Immunology Network has driven the development of a Human Immune Discovery Initiative (HIDI), an initiative that aims to improve accessibility to immunological assays and expertise for all researchers across the University (and beyond). HIDI will act as a gateway to immunological resources by sponsoring 4 Discovery Platforms within the Medical Sciences Division. As well as providing technical expertise, each Platform will offer advice on proposed projects where appropriate. It is anticipated that HIDI will benefit a range of disciplines, including but not limited to immunology, oncology, infection, neuroscience, metabolism, and others. Close links with OUH and OUI will allow the identification and rapid translation of research for patient benefit, if desired. Use flow cytometry to interrogate and isolate cell types within complex populations. 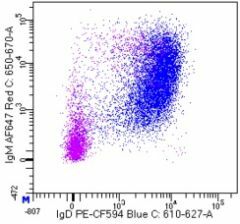 Flow cytometry can quickly and reproducibly reveal immune cell phenotypes within your sample, including B or T cell identification, and allows more complex immunophenotyping. For more information, please contact Helen Ferry, NDM Experimental Medicine Flow Facility Manager. The University of Oxford is also home to two CyTOF machines, one based at the Botnar Research Centre and managed by David Ahern, and the other based at the Weatherall Institute of Molecular Medicine and managed by Giorgio Napolitani. 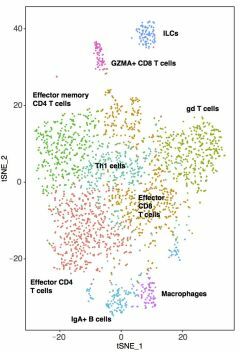 Investigate transcriptomic variation between cells, analyse rare or transient cell types and identify new types of immune cell. Please contact Calli Dendrou at the Wellcome Centre for Human Genetics or Neil Ashley at the Single Cell Facility, Weatherall Institute for Molecular Medicine for more information. James McCullagh (Department of Chemistry) is interested in the development and application of metabolomics to understand changes in metabolism in disease processes in particular for biomarker discovery, elucidating therapeutic targets and identifying the metabolic impact of genetic mutations. He runs a centre for metabolomics by mass spectrometry and welcomes collaborative research proposals. Please contact James for more information and visit his website. Use immune pathology to visualize immune cells within your tissue of interest using chip cytometry, multi-spectral imaging or microscopy. At the molecular level, use structural biology to interrogate the physical features of immune receptors, viruses and more. At the Peter Medawar Building for Pathogen Research, Chris Willberg is developing a platform of immune staining protocols to allow multi-colour visualisation within single tissue or cell suspensions. At the CRUK Oxford Centre, up to six biomarkers can be visualised simultaneously in fixed tissue sections allowing unravelling of tissue composition and complexity. Led by Errin Johnson, the state-of-the-art EM facility at the Sir William Dunn School of Pathology provides the expertise and technology to facilitate research. You can read more about the facility here. Micron Oxford aims to develop and apply new and emerging advanced microscopy technologies to facilitate important discoveries in basic biomedical research. To achieve this, Micron coordinates and manages the interdepartmental and interdisciplinary cooperation required to lower the activation energy for biologists to become early adopters of advanced imaging methods. The Biophysical Immunology Laboratory led by Marco Fritzsche aims to uncover the biophysical mechanisms underlying the human immune response. To study these often nanoscale processes on the correct spatiotemporal scales, research focuses on the development and application of live-cell super-resolution microscopy such as TIRF-SIM (total internal reflection fluorescence structured illumination microscopy) technology, which Marco recently established within the framework for an international collaboration between Professor Dong Li, Professor Eric Betzig and the University of Oxford's Micron, Professor Michael Dustin at the KIR and the WIMM. For more information please contact Kseniya Korobchevskaya. Immunopeptidomics utilizes mass spectrometry for MHC-associated peptide discovery in infectious disease and cancer. Use immunopeptidomics for neo-antigen discovery and to guide therapeutic and preventative vaccine development. Contact Nicola Ternette at the Jenner Institute and Target Discovery Institute for more information. Led by Daniel Ebner at the TDI, the cellular screening facility use multiple screening techniques to identify novel targets for potential therapeutic development. This includes cell-based arrayed small compound screens and CRISPR/Cas9 genome-wide screens. Please contact Daniel Ebner for advice on how this facility can help your immunology project. Led by Alison Banham, head of NDCLS, the monoclonal antibody facility has significant experience in the development, validation and characterisation of monoclonal antibodies. Please contact Amanda Anderson, the facility manager, for more information.